Sorry guys, the past few days have been rather unproductive for me as a blog keeper but I do have a good excuse - I had a big move coming up. You know, moving to another country. Which obviously meant that my last days in Finland were rather drenched with alcohol and farewell parties. And the actual moving as well. Which was a drag in such a state of hangover. Now I'm killing time at the Helsinki-Vantaa Airport, finally showing some signs of resurrection, so it's about time I channel my energy into something useful. Such as an unprofitable, under-the-radar music blog. Anyway. This time I'll be reviewing Róisín Murphy's second solo album Overpowered. Róisín is, in my opinion, one of the coolest people on the whole planet, and 2007's Overpowered is a nearly perfect pop album so what's not to like? You might not be exactly familiar with Róisín's work but you all have heard her before - before embarking on a solo career, she used to make up for 50% of the Anglo-Irish experimental duo Moloko, best known for their hits "The Time Is Now" and especially "Sing It Back". Yes, it's that singer we're talking about here. Overpowered was the follow-up to her 2005 solo debut Ruby Blue (another great record I might have to introduce sooner or later) and as of 2013, is her latest album to date. Unfortunately she's been too engaged in making babies to properly record a third album which has been in the making for quite some time. Ruby Blue was an experimental avant-garde album with jazz influences among others, but Overpowered is a more traditional pop effort. Written with producers such as Seiji of the Bugz In The Attic DJ collective and Groove Armada's Andy Cato, Overpowered is not as artistically ambitious as its predecessor but is just as brilliant nevertheless. The album which combines electropop with disco influences showcases Róisín as a disco diva - just listen to the majestic dance floor anthem "Let Me Know", which samples D Train's "Keep On" and Tracy Weber's "Sure Shot" with fantastic results. Also, a music video was filmed for the single release and has Róisín ordering food at a diner and turning the place into a party cave with a dance floor ceiling!!! A goddamn dance ceiling! How cool is that. 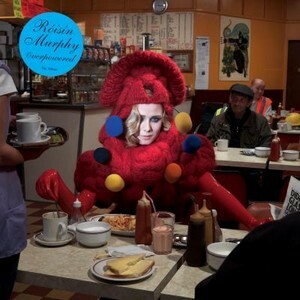 No, wait, how Róisín Murphy is that. Other singles include the title track "Overpowered" that could be a Groove Armada track - but is actually not one of the songs produced by the group's member Andy Cato, funnily enough - and is basically a chemical love song with lines like "Your data, my data / the chromosomes match". Then there's the glittering "Movie Star" whose John Waters influenced music video features a drag queen stepmother and a sexually abusive giant lobster (don't ask, just... watch) and finally there's "You Know Me Better", which serves as an easy-listening, radio-friendly tune with a danceable beat and a catchy melody. But ultimately, an album is just as good as its album tracks - it's not all about the singles. Thankfully this one's also strong on that side. Some of the highlights include "Checkin' On Me", positioned in the middle of all the singles but is barely overpowered by them - get it, overpowered? That was a pun very much intended - and then there's the cowbell-tinged powerhouse that is "Cry Baby". But that's not all! Check out "Primitive", for example: whereas "Overpowered" was a chemical love story, "Primitive" sees love between humans as an evolutionary routine. "Dear Miami" is a mesmerising song about global warming - is there anything she can't do? - and "Parallel Lives" closes the album with a dark electro stomper of a track. I'm not lying: the album is so full of excellent songs to choose from that it's actually easier to spot the less stellar ones out. "Footprints" and the three-song-combo "Tell Everybody"/"Scarlet Ribbons"/"Body Language" fail to live up to the awesome standards set by the rest of the album and therefore feel a little out of place. But that is not to say that the tracks themselves would be bad - it's just that the rest of the stuff is really that good. Oh, and if Róisín leaves you wanting for more, check out the b-sides from this era. "Unlovable", "Sweet Nothings" and the Bryan Ferry cover "Slave To Love" are excellent songs as well. Try at least: "Let Me Know", "Parallel Lives", "Primitive", "Cry Baby"